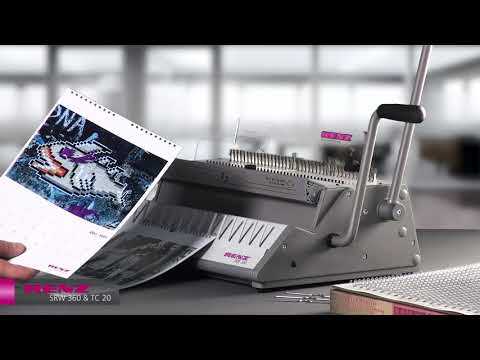 Insert the calendar into the Renz TC 20 punch. Push the lever and punch out 20mm thumb cut in the centre of the calendar. The horizontal closing mechanism of the SRW 360 allows you to bind the calendar easily together with the hanger. The Renz calendar kit contains an SRW 360 wire binding machine, TC 20 Hand Held Thumb Cut Calendar Punch, box of A4 wire and 100 hangers. The SRW 360 manual punching and binding machine is designed for low volume regular use and allows the flexibility for book and calendar work when combined with the TC 20 thumb cut punch. Using the SRW 360, deselect the 3 punch pins in the middle of the calendar and then punch the calendar normally. Remove the calendar, which will have 3 holes in the middle not punched out. Next, take the TC 20 and insert the calendar into the punch. Push the lever and punch out the 20mm thumb cut in the middle of the calendar. The horizontal closing mechanism of the SRW 360 allows you to bind the calendar together easily using the hanger.